Shaft seal rings are used for the sealing of vehicle components with rotating shafts, for example in engines, gearboxes and axles. Sealing with shaft seal rings avoids leakage of fluids, such as oils or grease. By reliable sealing of components, a longer service life is achieved. In addition, environmental pollution and the danger of accidents caused by leaking oil are prevented. 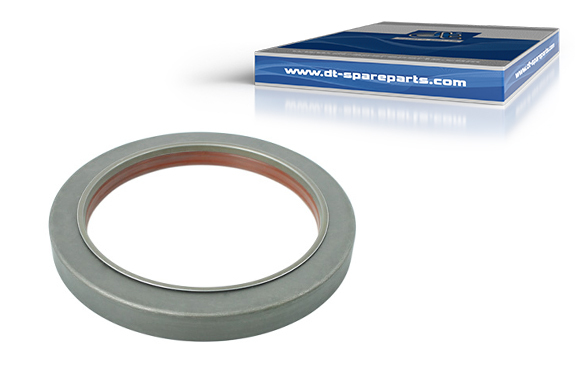 The DT® Spare Parts brand offers a variety of shaft seal rings for all areas of application. Here, the manufacturing process, the sealing lip profile and the materials used are optimally matched to the respective application, so that a reliable, long-term seal is guaranteed. The basic structure of the shaft seal rings is based on the standards DIN 3760 and DIN 3761. The range of the DT® Spare Parts brand includes simple shaft seal rings with only one lip, as well as versions with several lips and additional dust seal lips. Special forms, such as cassette seals or ABS rings are also included in the range. In order to achieve an optimal oil seal, the sealing lips are pressed onto the sealing surface by a annular spring. By accurately specified pre-tensioning of the spring, additional wear on the sealing lip and the sealing surface is reduced. A recent innovation are radial shaft seal rings with a sealing lip made of special PTFE material. Due to the material and the moulding, PTFE sealing lips have a pre-determined pressure and require no additional annular springs. Due to its structure, the PTFE material has an extremely high resistance to chemicals. The sealing lip is self-lubricating and can also be used at extreme temperatures up to +300°C. For the assembly, a mounting ring made of cardboard or plastic is usually supplied, so that the PTFE mounting lip is not deformed during installation. Unlike other materials, PTFE must in no case be greased; otherwise tightness is no longer ensured. To enable professional installation of PTFE shaft seal rings of the DT® Spare Parts brand. In addition to shaft seal rings, DT® Spare Parts offers all other standard articles for the repair and maintenance of engines, gearboxes and axles.